Is your computer performing slowly, or are you looking for a way to boost performance? If your computer is more than a couple of years old, replacing the hard drive with an SSD (Solid-State Drive) is one of the most cost-effective changes you can make. This will totally change your computing experience. What Is an SSD? Historically, most computers have used spinning hard disk drives for permanent data storage. Conceptually, hard drives work a bit like old-fashioned record players. They contain spinning platters. A part called the actuator moves a tiny arm that floats a miniscule distance above the surface of the disk platters. The read/write head on that arm magnetically reads and writes binary data concentrically on the disk. Those disks spin on central motors, and those motors spin at high rates of speed (thousands of revolutions per minute). So there are a lot of moving parts inside a hard disk drive. They’re built to last, but they do eventually wear down and wear out. Hard drives can also be noisy and use a fair amount of power – additional reasons to consider an SSD switch especially if you’re a laptop user. Spinning hard drives are also more delicate and prone to failure if they’re dropped too hard. By comparison, SSDs contain a form of non-volatile computer memory. In other words, the information stays put on memory chips once it’s been written. That’s different than the regular RAM in your computer, which is reset when you turn off or restart the computer. Since computers are used to accomplish a wide variety of personal and professional tasks, the increased speed and efficiency of an SSD means that you’ll have the ability to get more done in less time. 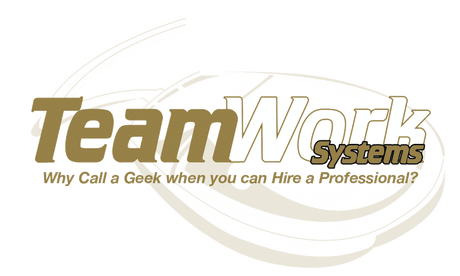 At TeamWork Systems, we have performed hundreds of SSD upgrades with great results and enthusiastic reviews. We have the process down to a science and can upgrade your computer on site with minimal down time. We also offer flat rate pricing which has proved to be cost effective and received warmly by our clients. Life moves fast and your computer should too.